Each year, globally 0.287 million women die from pregnancy related complications and 7 - 10 million experience life threatening complications. In developing countries, one in 150 and in developed countries one in 3800 is the probability of death due to pregnancy and birth related complications. Non-availability of emergency obstetric services during pregnancy, birth, post birth, compounded by inability of women to recognize the need and inability to seek care during pregnancy, birth, post birth and lack of quality care, are believed to be the major causes of high maternal morbidity and mortality in developing countries. Specialized critical care is not available to severely ill women at many places, either because of lack of infrastructure, or the staff not being geared to take care of emergencies. UNICEF reported that for every woman who dies from a pregnancy related cause, around 20 experience sickness. Studies of case fatality among severely ill have revealed highest fatality in resource poor settings of South Africa 1:5[4,5], closely followed by India 1:11, markedly less in developed countries, United Kingdom 1:118, France 1:222 and lowest in Canada. Survival and case fatality in severely ill cases in low resource settings have not been studied well. Present study was carried out to know the survival and case fatality in seriously ill cases, to know the issues which lead to deaths in settings with limited resources. Prospective study of severely ill obstetric cases over a period of five years in 2009 managed in the Critical Care Area (CCA) of department of obstetrics gynaecology of a rural referral institute in central India was done after approval of the ethics committee of the institute. Many who sought services were having very low resources (around 1 dollar per day per capita income, sometimes evens less). It is a referral medical institute, not the only one, but most of the seriously ill of the area are referred to this institute, may be because of low cost, better quality services. Informed consent was taken from the women or the relative. All the severely ill obstetric cases directly admitted to CCA or transferred to CCA from wards, were included in the study. Criteria for diagnosis was, admission to the unit that provided 24-hours medical supervision, with mechanical ventilation, continuous vasoactive drug support in potentially life-threatening situations. During the period of analysis of cases of 5 years, there were 32,655 obstetric admissions and 21,277 births occurred and 455 women (study subjects) were admitted to CCA and accounted for 1.3% of obstetric admissions and 2.1% births. The standard modes of diagnosis of the illnesses were used. Severity was the need to keep CCA, however there were no defined criteria. Of these 455 severely ill women, 47 died, case fatality of 10.3%, (0.14% of obstetric admissions, 0.22% of births, 0.88% of cases hospitalized for obstetric disorders). Of the 47 women who died, 21 were rural (44% of those who died, 11% of all rural severely ill women), 8 were urban (17% of all deaths, 5% of urban severely ill cases) and 18 were of low resource urban settings (38% of deaths, 16% of severely ill from low resource urban), significantly more case fatality in women of low resource urban settings (P < 0.05). Four (8.6%) women were of less than 20 years (33% of severely ill cases of teen age) and 7 (14.8%) were of more than 30 years (22% of severely ill women of 30 years and above). Thirty six (76.6%) women who died were of 20 - 29 years, (9% of severely ill cases of this age). Case fatality was highest in severely ill teenagers (significantly more, P < 0.05). Of 47 women who died, 24 were nullipara (8.5% of 282 severely ill nullipara women in severely ill) and 23 multipara (13.2% of 173 all severely ill multipara) [insignificant difference P > 0.05]. Of 47 women who died, 39 (83% of all cases who died) had reported in emergency with almost no care during pregnancy, 7 (15% of all deaths) had occasional checkups during pregnancy and one woman (2% of all maternal deaths) had multiple visits to prenatal clinic, however last visit was more than 30 days prior to admission with severe illness. It was further revealed that case fatality in severely ill cases of clinically & investigationally diagnosed acute fatty liver of pregnancy (AFLP) was 100%. Severely ill cases of preeclampsia and eclampsia with HELLP (Haemolysis, Elevated Liver Enzyme, Low Platelet Count) syndrome had 43% mortality and cases of severe illness due to hepatitis or malaria or pneumonia had 37% fatality. Women who were severely sick due to hemorrhage had 25% fatality. Severely ill women with traumatic postpartum hemorrhage (PPH) had 22% fatality, atonic PPH had 5% fatality and in cases of severe illness due to placental abruption, fatality was 6%. Three other severely ill women who died, one each, had splenic rupture following road traffic accident (RTA), thyrotoxicosis and acute exacerbation of bronchial asthma. There was no mortality in women who were severely ill because of ectopic pregnancy or gestational trophoblastic disease or placenta praevia or rupture uterus. Two maternal deaths occurred in first trimester (4.2% of all deaths, 12% of severely ill women of first trimester), both had septic abortion (50% of severely ill cases of septic abortion). Of 34 women admitted with severe sickness in second trimester, 4 died (8.5% of all deaths and 12 % of severely ill cases admitted in second trimester). Two had cardiac disorders including a case of hemolytic severe anemia with congestive cardiac failure with spontaneous abortion; one had infective hepatitis and one eclampsia with cerebral hemorrhage. Twenty deaths occurred in third trimester, (42.5% of all deaths, 8.1% of 246 severely ill cases admitted in third trimester). Eleven women were having hypertensive disorders (55% of all deaths in third trimester). Three deaths (15% of deaths in the third trimester), were to incidental or accidental causes, one each due to splenic rupture following RTA, thyrotoxicosis and acute exacerbation of bronchial asthma. Thirteen women died during labor (28% of all deaths, 15% of 84 severely ill women admitted in labor). Five deaths (38%) were due to medical disorders. Two were severely ill due to valvular heart disease, one due to cardiomyopathy, one had severe anemia due to Sickle Cell Disease (SCD) & one was critically ill with acute exacerbation of bronchial asthma). Four critically ill women had hypertensive disorders (one each of preeclampsia with HELLP & eclampsia, two were of eclampsia with HELLP), 3 women were severely sick due to hemorrhage, (one due to placental abruption and two traumatic PPH). There were 8 postnatal deaths (17% of all deaths, 15% of 54 severely ill postnatal cases). Three were severely ill due to eclampsia, two due to puerperal sepsis and one each due to atonic PPH, pneumonia and amniotic fluid embolism (Table 1, Figure 1). Table 1: Severely Ill Obstetric Cases and Case fatality Over 5 Years at a Referral Institute in Central India. Note: Case fatality is out of severely ill cases and not total cases. 3 other women who died had – Splenic rupture following Road Traffic Accident, Thyrotoxicosis & Acute exacerbation of Bronchial asthma, one each. 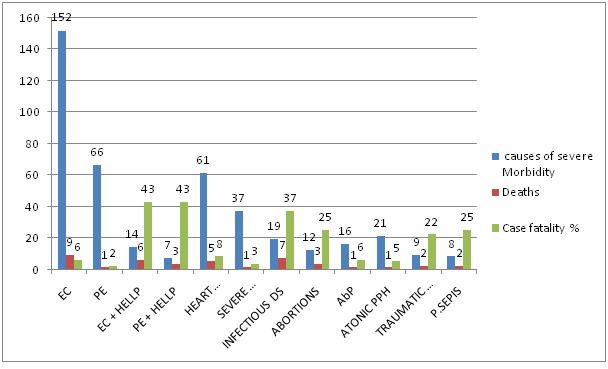 Figure 1: Causes of Severe Illness and Deaths Over 5 Years at a Referral Institute in Central India. Women with severe illness during pregnancy, labour or post partum survive, with or without permanent disability, sometimes die. Women who are seriously ill undergo the pathway, similar to those who die, characterized by multiorgan dysfunction or other shock related syndrome. Timing & appropriateness of therapy explain part of the huge difference in survival and case fatality between developed and developing countries[4-7]. The survival in seriously ill cases is usually an indicator of the quality of emergency care, available and used, but it has not been studied well in resource poor settings. It is essential to audit health-care facilities or the health-system’s performance, depending on the health-care level at which the approach is implemented for improving the outcomes. In the present study, case fatality among severely sick women was 10%. Minkauskiene et al have reported severe maternal morbidity ranging from 0.07 to 8.23% and the case-fatality ratio in such seriously ill cases ranging from 0.02 - 37%. Oladapo et al. have reported 17% mortality in births with life threatening obstetric conditions. Tank et al. from India reported case fatality of 42.4%. Vandecruys et al. reported 20% case fatality from South Africa. In developed countries, it is 10 to 20 times less, with reports of 1:118 from Great Britain, 1:222 from France. Large number of women, who could be saved, die in developing countries due to lack of availability of critical care. In the present analysis, women who died represented 1.1% admissions from villages, 1.2% of townships and 3.3% from low resource suburbs. Overall 44% of severely ill women were rural, 39% were from low resource urban and 17% from urban. Case fatality was highest in severely ill women from low resource urban settlements, 16%. It was 11% in rural and 5% in urban women (significant difference, p value < 0.05). Okwemba et al. from from Nairobi have also reported more chances of death in women from low resource urban settings than the national average. Of all severely ill women who died, 83% (39 of 45) had reported in emergency with no prenatal care. Osinaike has also reported 78% emergency cases with no prenatal care amongst severely ill obstetric cases. A severely ill woman with nothing known about her basic health creates problems in diagnosis and management, because of delays in the understanding, which contributes to case fatality. It was further revealed that 55% of severely ill women were admitted antenatally, 28% in labor and 17% postnatal, but case fatality was 8.2% during pregnancy (7.6% cases of first trimester, 15.3% second trimester and 76.9% third trimester), 15.4% during labour and 14.8% in severely ill postnatal women. It is essential that there is awareness about possibility of severe illness post birth. Generally after the baby is born, it is believed to be smooth sailing and critical watch is not kept. While overall case fatality in severely ill cases was 10%, it was 100% with severely ill cases of acute fatty liver of pregnancy. In severely ill women of eclampsia/preeclampsia with HELLP and/or intracerebral hemorrhage and / or coagulation defects and acute onset pulmonary edema, fatality was 43%. In general in severely ill women of eclampsia without HELLP it was 6% and in preeclampsia 2%. Girard et al reported one maternal death amongst 223 severely ill cases (110 of hemorrhage, 105 pregnancy induced hypertension and 8 sepsis). The frequency of these diseases was an estimated 8 per 1000 births. Waterstone et al in their study reported the incidence of severe obstetric morbidity as 12/1000 deliveries, five maternal deaths out of 588 attributed to conditions studied. Disease specific morbidities per 1000 deliveries were 6.7 (6.0 to 7.5) for severe haemorrhage, 3.9 (3.3 to 4.5) for severe pre-eclampsia, 0.2 (0.1 to 0.4) for eclampsia, 0.5 (0.3 to 0.8) for HELLP syndrome, 0.4 (0.2 to 0.6) for severe sepsis, and 0.2 (0.1 to 0.4) for uterine rupture. Most events are related to obstetric hemorrhage and severe pre- eclampsia. Vasquez et al. have reported 8% mortality with hypertensive diseases of pregnancy. Authors reported that, those with intracranial hemorrhage were the most acutely ill, those requiring mechanical ventilation had highest fatality. In the present study neurological and hematological failure had the highest mortality, and cases with Adult Respiratory Distress Syndrome (ARDS) had better outcome. Main cause of death was multiorgan failure (44%). Dalal et al. reported that the mortality was proportional to the number of organs failed. Irene et al. did a study to assess the maternal morbidity during pregnancy, delivery and postpartum period. In their study 43.63% (24/55) women died, most of them due to multi-organ dysfunction. Khosla et al. reported case fatality of 13.84 and Mac cord et al. of 0.49. In the present study, case fatality was 37%, amongst severely ill cases with medical illnesses, like malaria, infective hepatitis, pneumonia, next to hypertensive disorders during pregnancy. Heart disease had fatality of 8%; major contributor was valvular heart disease due to which 5 out of 61 women (8%) with severe illness died. Dalal et al in their study have reported 44% patients having infectious aetiology, of which puerperal sepsis accounted for 15%. Sometimes medical disorders in pregnancy go unrecognized and untreated, till women become seriously ill. Malaria alone contributed to 15% cases. In the present study abortion complications and puerperal sepsis had case fatality of 25%, 3 out of 12 and 2 out of 8 severely ill women of septic abortion and puerperal sepsis respectively, dying. In spite of the abortion law and network of health care, in India, women try unsafe abortion and report with severe sickness, septicemia and die. Two of the nine severely ill women with traumatic PPH died, one out of 22 severely ill cases of atonic PPH. The case fatality for traumatic and atonic PPH was 22% and 5% respectively. Delay in right treatment at right time was the major cause of mortality due to PPH. Of the total 30 severely ill cases of PPH, 21 (70% of 30) were severely ill because of atonic PPH and one died (case fatality 4.76%). A continuum from community to specialized care is essential. Out of 16 severely ill cases of placental abruption one died, (6% fatality) due to multiorgan problem. There was no mortality in severely ill women having ectopic pregnancy or hydatidiform mole or placenta previa or rupture uterus, where heavy haemorrhage was the cause of severe illness. These women could get immediate, appropriate management and so they survived. Prual et al. have reported one death out of 32 cases (3.2%) in severely ill cases with case fatality varying in different disorders, 33.3% for sepsis, 30.4% for uterine rupture, 18% for eclampsia and 2.8% for severe hemorrhage in the study done in urban settings Western Africa, where there is good access to health and high order utilization by pregnant women. Assef et al have reported that bronchial asthma, sickle cell disease and hypertension, are frequently reported pre-existing illnesses which predispose to severe illness and accounted for over two-thirds of the illnesses. We had 12.8% fatality with such illnesses. Bibi et al, have reported that severity of morbidity significantly increases, if pre-eclampsia / eclampsia are associated with respiratory distress, similar to the present study. Driessen et al have reported majority of deaths due to sepsis following prolonged neglected labor in cases who developed multiorgan failure. Obstetric hemorrhage was fatal when it was due to uterine atony in multiparous women. In a study by Tucker et al, Pregnancy Mortality Surveillance System reported five pregnancy complications (preeclampsia, eclampsia, abruptio placentae, placenta previa and PPH) accounting for a quarter of the pregnancy related deaths. Excess mortality from a condition could be caused by a higher prevalence of the condition, a higher case fatality rate or a combination of these factors, as was in the present study where there were more severely ill women due to hypertensive disorders and had more case fatality also. Waterstone et al reported that severe obstetric morbidity and its relation to mortality may be more sensitive measure of pregnancy outcome than mortality alone. In the present analysis, it was revealed that case fatality was 10% in women with severe illness due to various disorders during pregnancy, labour or postpartum. The most common condition which was responsible for severe illness and mortality also, was hypertensive disorders, especially when associated with HELLP. Second were medical disorders, highest with acute fatty liver. Severely ill women with ectopic pregnancy, hydatidiform mole, uterus rupture could be saved but in severely ill due to PPH, fatality was 4.75%. It appears a lot needs to be done for preventing severely illness and improving outcome, if severe illness occurs because of various disorders. 1. WHO, UNICEF, UNFPA and The World Bank estimates. Trends in maternal mortality 1990 to 2010. (2012) World Health Organization. 2. Osinaike, B., Amanor-Boadu, S., Sanusi, A. Obstetric Intensive Care: A Developing Country Experience. (2006) Internet Journal of Anesthesiology 10(2). 3. Child Info Monitoring the situation of children and women, A Report Card on Maternal Mortality 2008. (2014) UNICEF. 4. Mantel, G.D., Buchmann, E., Rees, H., et al. Severe acute maternal morbidity: a pilot study of a definition for a near‐miss. (1998) Br J Obstet Gynaecol 105(9): 985-990. 5. Vandecruys, H.I., Pattinson, R.C., Macdonald, A., et al. Severe acute maternal morbidity and mortality in the Pretoria Academic Complex: changing patterns over 4 years. (2002) Eur J Obstet Gynecol Reprod Biol 102(1): 6-10. 6. Minkauskienë, M., Nadiðauskienë, R., Padaiga, Z., et al. Systematic review on the incidence and prevalence of severe maternal morbidity. (2004) Medicina (Kaunas) 40(4): 299-309. 7. Perinatal health indicators for Canada: a resource manual. Minister of Public Works and Government Services Ottawa. (2000) Health Canada. 8. Oladapo, O.T., Sule-Odu, A.O., Olatunji, A.O., et al. "Near-miss" obstetric events and maternal deaths in Sagamu, Nigeria: a retrospective study. (2005) Reprod Health 2: 9. 9. Tank, P., Nadanwar, Y., Mayadeo, N. Outcome of pregnancy with severe liver disease. (2002) International Journal of Gynecology & Obstetrics 76(1): 27-31. 10. Okwemba, A. Slums dwellers take lead on maternal deaths (2009). 11. Girard, F., Burlet, G., Bayoumeu, F., et al. [Severe complications of pregnancy and delivery: the situation in Lorraine based on the European investigation]. (2001) J Gynecol Obstet Biol Reprod 30(6 Suppl): S10-S17. 12. Waterstone, M., Bewley, S., Wolfe, C. Incidence and predictors of severe obstetric morbidity: case-control study. (2001) BMJ 322(7294): 1089-1093. 13. Vasquez, D.N., Estenssoro, E., Canales, H.S., et al. Clinical characteristics and outcomes of obstetric patients requiring ICU admission. (2007) Chest 131(3): 718-724. 14. Dalal, N., Patkar, V., Karnik, N. Critical care in obstetrics. (1999) Bombay Hosp J 41(3): 512-516. 15. Irene, Y.V., Vaneet, K., Gurvinder, K., et al. Critical care in obstetrics-scenario in a developing country. (2008) J Obstet Gynecol India 58(3): 217-220. 16. Khosla, A., Dahiya, K., Sangwan, K. Maternal mortality and 'near-miss' in rural north India. (2000) Int J Gynaecol Obstet 68(2): 163-164. 17. McCord, C., Premkumar, R., Arole, S., et al. Efficient and effective emergency obstetric care in a rural Indian community where most deliveries are at home. (2001) Int J Gynaecol Obstet 75(3): 297-307. 18. Prual, A., Bouvier-Colle, M-H., Breart, G., et al. Severe maternal morbidity from direct obstetric causes in West Africa: incidence and case fatality rates. (2000) Bull World Health Organ 78(5): 593-602. 19. Assef, P., Bacallao Gallestey, J., Alcina Pereira, S., et al. Severe Maternal Morbidity in the Intensive Care Unit of Havana Teaching Hospital, 1998 to 2004. (2008) MEDICC Rev 10(3): 17-23. 20. Bibi, S., Memon, A., Sheikh, J., et al. Severe acute maternal morbidity and intensive care in a public sector university hospital of Pakistan. (2008) J Ayub Med Coll Abbottabad 20(1): 109-112. 21. Driessen, M., Bouvier-Colle, M.H., Dupont, C., et al. Postpartum hemorrhage resulting from uterine atony after vaginal delivery: factors associated with severity. (2011) Obstet Gynecol 117(1): 21-31. 22. Tucker, M.J., Berg, C.J., Callaghan, W.M., et al. The black–white disparity in pregnancy-related mortality from 5 conditions: differences in prevalence and case-fatality rates. (2007) Am J Public Health 97(2): 247-251.